“How can I join your community?” is a common question with a long answer. Visiting is the first step. Entrance into the Sravasti Abbey community is a gradual process. Whether you are ordained now or a layperson exploring the possibilities of training, the journey begins with the application form and a request to visit. See the Event Schedule to find out what’s going on at the Abbey. The Sravasti Abbey community shares a common way of living the monastic precepts. We share common Dharma practices rooted mostly in the Gelug tradition of Tibetan Buddhism. 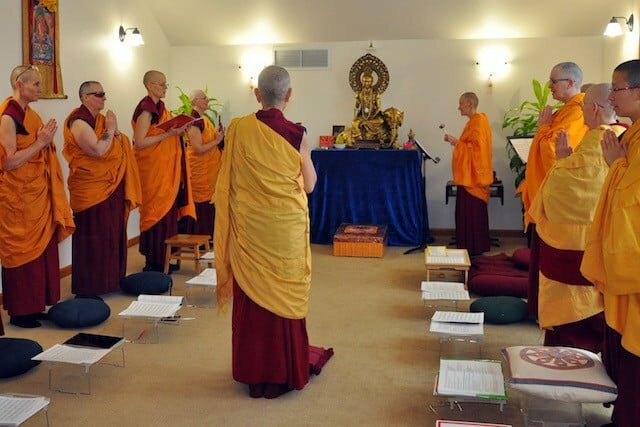 Read more about our founding Dharma principles and developing a Monastic Mind. Everyone—residents and guests—follows a full daily schedule that includes meditation, offering service, Dharma teachings, and discussion. We are committed practitioners, and the Abbey is our home. Community life can give the support and discipline you need for sustained practice. All residents follow the guidance of our abbess, teachers, and senior monastics, while taking responsibility for their own spiritual practice. People who want to be entirely independent or resist guidance and instruction will not be happy at the Abbey. People have a variety of reasons for wanting to join our community. You may have a clear wish to ordain and know you want to train for monastic life. Maybe you find monastic life appealing and want to see if it’s right for you. You might be ordained now and seek a community to live and train with. Perhaps you want to deepen your Dharma practice as a long-term lay resident. 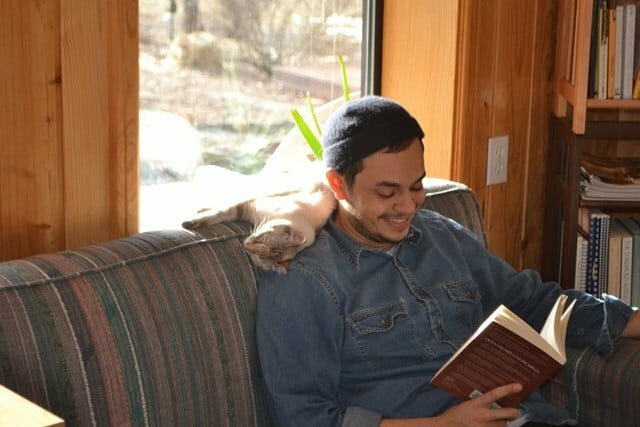 All are valid reasons to begin the residency process at Sravasti Abbey. People wishing to ordain should be under 50 years of age. There is no specific age limit for long-term lay residents. However, applicants should be able to keep the full daily schedule. Living in a rural area without access to your own car, television, music, or Internet access in your room and eating a vegetarian diet can be quite challenging for some people. It’s good to consider these realities before asking to join the community. Why does the Abbey have an age limit for ordination? The Abbey age guideline is a practical consideration. Many monasteries in Taiwan have an age limit, as does Thich Nhat Hanh’s sangha. 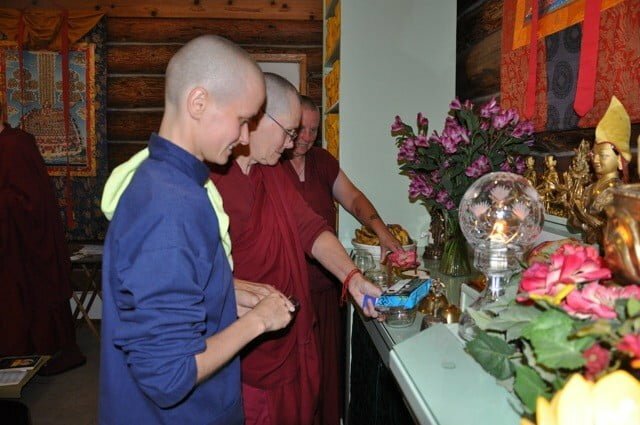 In the Vinaya, ordaining preceptors are directed to provide the requisites—food, clothing, shelter, and medicine—for their monastic followers. Sravasti Abbey commits to lifelong support for monastics who ordain here for as long as they live at the Abbey. At the Buddha’s time, Dr. Jivaka provided free medical care to all monastics. There was no health insurance, and if you needed a tooth extracted, the barber in the bazaar did it. Nowadays, medical and dental care are costly, insurance premiums are uncertain, and there are still out-of-pocket expenses. Looking long term, we need to be sure that the Abbey can financially and emotionally support the monastics we ordain, thus we need a good balance of ages in the community. If there are too many elderly monastics, it will be a burden on the younger monastics and hiring full time care is impossible to afford. The Abbey is happy to have sangha of all ages visit and train for periods of time. The possibility of anagarika ordination remains. 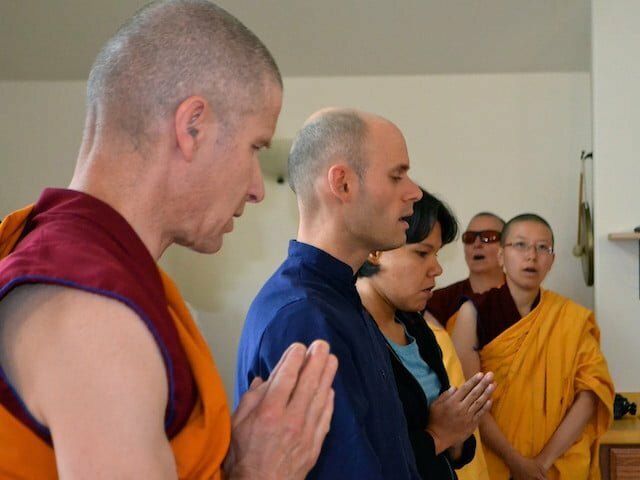 We also encourage people with monastic aspirations in many other ways, including through the annual Exploring Monastic Life program and by offering the material in the Monastic Life section of thubtenchodron.org. These beginning steps pertain to all applicants: monks, nuns, and lay people. You should be familiar with our abbess, Ven. Thubten Chodron, and her way of teaching before exploring residency at the Abbey. We recommend that you come for a short visit to get acquainted with the community and our lifestyle. Go to the Event Schedule to check out the possibilities. You can arrive a little early or stay afterwards to give time to get to know each other. Study the Visit section too. After the first taste of Abbey life, you may apply for a longer visit—6 to 12 weeks. Long-term guests perform a formal Request for Training ceremony to signify your intention to train under Abbey guidelines. All long-term guests keep the 5 lay precepts plus celibacy for the duration of your stay. After the long visit, we require you to take time away to assess your experience. At this point you may apply for provisional residency, reviewed every 3 months, for one year. Training for ordination at the Abbey is also a gradual process. You’ll learn a lot by thoroughly reading the Ordaining page. People who want to pursue ordination first complete all the first steps described at left. After a time in the long-term visit, you may request anagarika precepts. This begins a formal period of training and self-assessment to see if monastic ordination is right for you. At the Abbey, ordination is viewed as a lifelong commitment and we approach this carefully. Anagarikas shave their heads, wear a blue training uniform, and participate in many aspects of community life. The anagarika period may or may not lead to ordination. The purpose is to help you make a clear decision about where and how you want to direct your life. We practice in the Dharmaguptika Vinaya and follow that tradition’s ordination guidelines. In general, we try to hold novice ordination ceremonies for both nuns and monks at the Abbey. After about two years of training, a novice may request full ordination as a bhikshu (monk) or bhikshuni (nun). The full ordination ceremony is complex and the training requires the participation of many senior monastics. For this reason, Abbey nuns and monks receive their full ordination at temples in Taiwan. We aspire to have the seniority, training, and skill to offer full ordination at the Abbey someday. What if you're already ordained? It is best for you to spend the first few years of training with your ordination master or main spiritual mentors (if these are different people). You have great faith in and strong karmic connection with your teachers. Their guidance is critical in shaping your monastic life experience. Newly ordained sangha are welcome to visit the Abbey for short stays and to attend retreats and other programs. We especially encourage you to come for the Exploring Monastic Life program. You can apply for residency by following the steps above. It’s important that you be willing to adopt the Abbey’s schedule and practices if you want to live here. 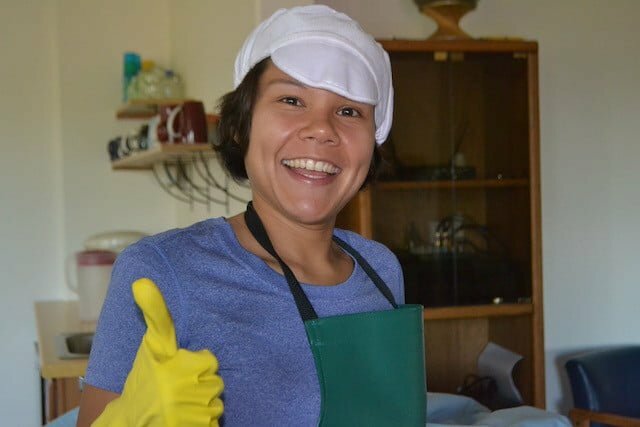 Tibetans speak of the nay ki lama, the resident “teacher of that place.” While visiting or living at the Abbey, nuns and monks whose principal teacher lives elsewhere must be ready to follow the Dharma and Vinaya guidance of abbess Ven. Thubten Chodron. Sravasti Abbey is in a rural area, ideal for quiet monastic living. Residents adopt a simple and virtuous lifestyle, learning to find contentment through Dharma study and practice. 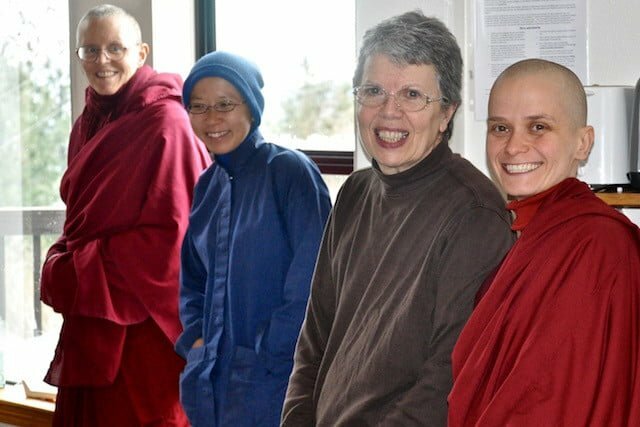 We use community life as the training ground for keeping our monastic precepts and for developing a “monastic mind”— the correct attitude and outlook that supports nuns and monks to grow our compassion and wisdom. Three months of retreat each winter. At this time we close the Abbey to short-term visitors so the resident community can engage in more intense Dharma practice. Some guests attend either the first month or all three months of the retreat with us. Find out what's happening at the Abbey. Learn from books by Ven. Thubten Chodron.